Last week, Washington DC saw speakers at a religious freedom roundtable, chaired by the US Ambassador for Religious Freedom, Sam Brownback, express concern over "eroding" space for religious freedom in India. Dr Mike Ghouse, executive director, of the Center for Pluralism in Washington DC, referring to the roundtable, said in an email alert that Indian-Americans have "a moral duty to prevent India from being labeled as a Country of Particular Concern by the United States Commission on International Religious Freedom (USCIRF)". "If India were to be ascribed with such a label, it would hinder the flow of foreign direct investments and subsequent reversal of economic prosperity achieved in the last twenty years. This label may not affect the poor Indians, but it will severely impact all those Indians working in information technology related jobs and businesses involved in software development and services", he added. Pointing out that his NGO has been involved in bringing together persons from diverse religions to come together, Ghouse said, those who active include Jay Kansara of the Hindu America Foundation, John Prabhudoss of the Federation of Indian American Christians of North America, and Ajit Sahi of the Indian American Muslim Council. The roundtable saw, among others, Swami Agnivesh, well-known saffron human rights activist, speak to a group of religious freedom defenders across the world. 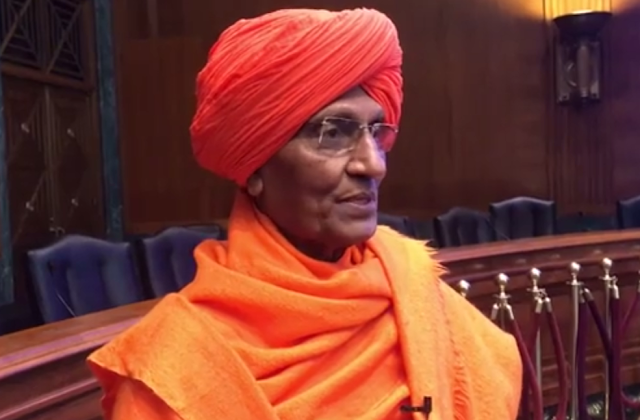 Agnivesh, who reached Washington DC after giving keynote address at the Parliament for World’s Religions in Toronto, where, he said, Hindu rightwing forces tried to prevent him from speaking, recalled that as a campaigner for justice for 50 years he faced numerous attacks on his life, the most recent in Jharkhand in July, when hundreds of goons attacked him, and then again in Delhi in August. Dear Ambassador Brownback and my fellow campaigners for human rights and religious freedom. I am grateful to you for this opportunity to speak here. Since the time allotted for me to speak is limited, I will get to the point immediately. There is a grave threat today to civil liberties in general and religious freedom in particular in India. Indeed, the levels of violence we see in today’s India against the social and religious minorities are in many ways unprecedented in recent decades. The victims of such vicious violence are some of India’s poorest and most disadvantaged communities. They include Muslims, Christians, the Dalits, who are the former untouchables of the Hindu caste society, and the Adivasis, or the indigenous tribal people whose very existence is under threat. Moreover, the perpetrators of this violence are directly linked with the RSS, which is the mother organization of Prime Minister Narendra Modi’s BJP party. Especially since Mr. Modi became India’s prime minister in 2014, the attacks on the religious minorities have sharply increased. Armed mobs owing allegiance to the RSS and other Hindu groups have been lynching to death Muslims at will, accusing them of eating beef or slaughtering a cow. Such Hindu mobs also disrupt mixed-religion weddings in which the groom is Muslim, and the bride is Hindu because they don’t want Hindu girls to marry Muslim boys. There have been instances in which such Muslim grooms have been killed, too. Similarly, these vigilante groups owing allegiance to the RSS have been attacking Christian Churches, priests, and congregants all over India. Once again, they blame the victims for the violence, accusing the Christians of converting Hindus to Christianity. For thousands of years, the Dalits have suffered the worst violence and indignities at the hands of upper caste Hindus. However, now, that indignity is doubled because laws have been created to deny positive quota benefits to Dalits who convert out of Hinduism to Christianity and Islam. Converted Dalits face even greater violence and assault. As for the Adivasis, the indigenous people, the RSS-BJP have for decades been forcing Hinduism on them even though millions of these Adivasis clearly state that they are not Hindus and they have their indigenous faiths. I have myself been a victim of their violence over the years. Twice in the last six months only I have been attacked by these violent mobs. Of course, it is futile to expect any police action against such violent perpetrators. If I being a prominent human rights defender in India cannot expect the police to act against my attackers, you can imagine what would be the story of these social and religious minorities I have spoken about, the Dalits, the Adivasis, the Christians and the Muslims, who are being targeted in their hundreds of thousands across India. Even more worrying is that some organizations in the United States that claim to represent the interest of the Hindus defend the highly divisive and violent activities of the RSS-BJP and instead blame the religious minorities. They try to create a false equivalence between the highly organized and structural violence of the RSS-BJP, who are in power in the federal government in India as well as more than a dozen and a half of India’s 29 states, and random acts of violence against Hindus that may occur. The truth is that the biggest perpetrator of anti-minority violence in India is the RSS-BJP, which is now in power across India and is therefore grossly abusing its control of government machinery to provide impunity to its henchmen carrying out such violence. It would be a pity if the international community did not open its eyes and take notice of this worsening situation in the India of Mahatma Gandhi.